As the weekend starts, it’s time to Getaway from the everyday Bangkok busy life. 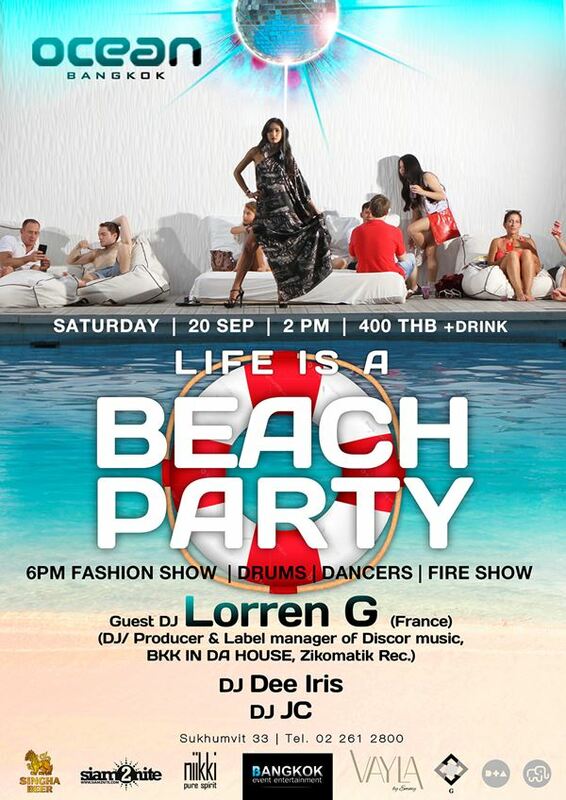 So on Saturday 20th of September Ocean Bangkok together with Valya fashion beachwear will introduce the Monthly LIFE IS A BEACH PARTY! Guests will get a chance to step away from the everyday city life, and enjoy at our All-day and night Beach Party. There will be a fashion show of the new collection of Valya Beachwear around the pool at 6 PM. Experience style, passion and exotic colors with the new collection of Vayla Beachwear. A new shop displaying their products will be open at Ocean. Come start your weekend early at Ocean Bangkok and lounge by our Pool. The best Bangkoks djs will play aside our very special guest DJ on that day: LORREN G from France. One of only few French Djs to have reached the Number 1 ranking in the UK Charts!!!! !